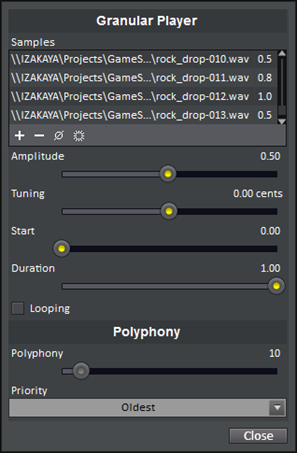 Thanks to the large number of audio processing modules available in its visual patching environment, GameSynth is the perfect tool for sample mangling! Moreover, by mixing both synthesis and sample manipulation, you can create truly amazing sounds. 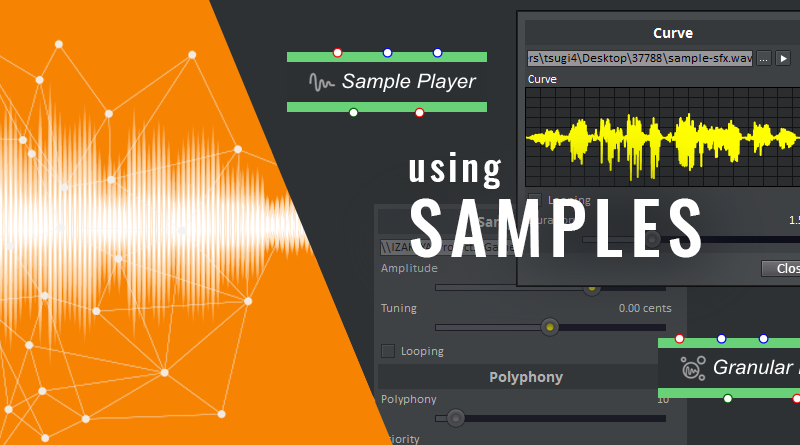 In this post, we will see how you can process existing recordings to create voice effects, play them in sync to simulate firing weapons or even perform granular synthesis! 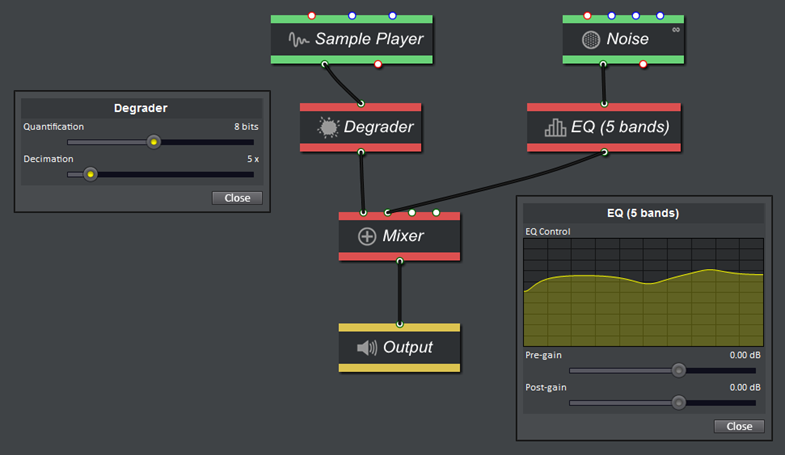 All you need to create sample-based sound effects in GameSynth’s visual patching environment is a Sample Player module. Simply connect it to an Output module, and voilà! You are already playing a sample and you can adjust its amplitude and playback speed, make it loop or trigger it in rhythm. From here, the possibilities are endless. For example, let’s create some voice effects! What about a robot? Simply add a Vocoder or a Ring Modulator module and you are all set! 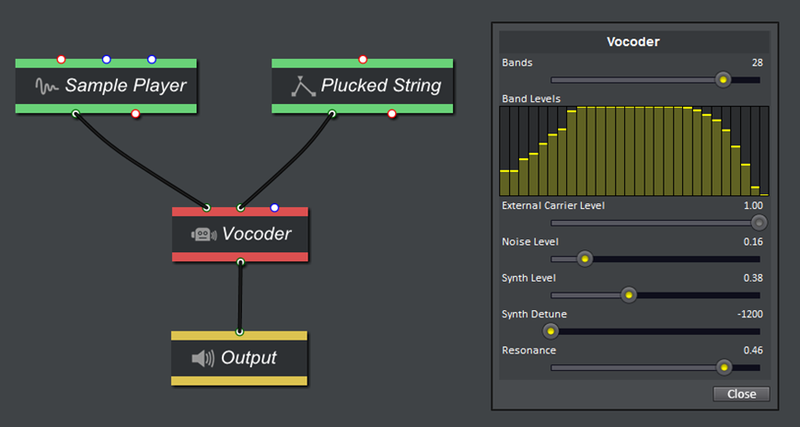 In the Vocoder, you can change the number of bands at will, their magnitude and the type of carrier signal. 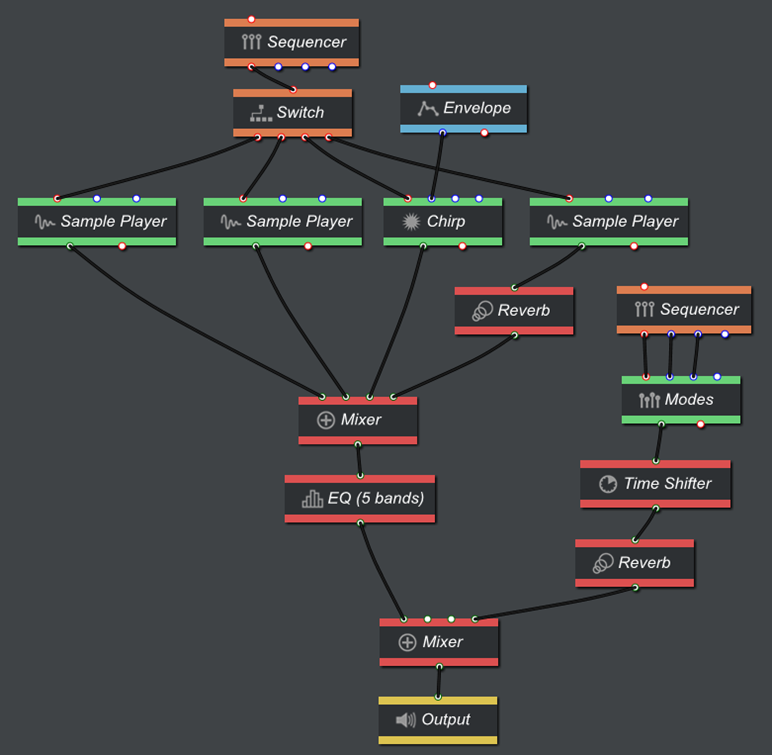 You can add as many modules as you want to create rich, evolving, and out-of-this-world vocals with GameSynth. And that’s not even mentioning the upcoming free VoiceFX model! You can of course add more than one Sample Player module to your patch. GameSynth offers all the modules necessary to play them simultaneously as layers or to sequence them. For example, the patch below recreates the firing sequence of a weapon. At the top, the combination of the Sequencer and Switch modules allows us to trigger different generators following a precise timeline. In this case, different parts of the weapon are simulated as well as the firing itself. A second branch of the patch creates the metallic impact sounds coming from the casing. As you can see, in this patch we are combining sample playback with synthesis (for both the firing and the modal resonance of the casing). To conclude, the casing impacts are delayed by a Time Shifter module as they happen after the shot and several audio processors have been added to shape the final sound, such as reverberations and a graphic equalizer. Of course, one of the advantages of GameSynth is that most parameters in this patch can be controlled in real-time based on what is actually happening in the game. The patch itself can communicate back to the game (for example when one of the parts of the weapon has finished paying) through GameSynth’s event system. The visual patching environment of GameSynth also offers a Granular Player module. As its name indicates, this module is perfect to perform granular synthesis. Indeed, it allows you to select many samples and to assign a weight to them. Every time the trigger input of the module is activated, a new grain will be started, whose waveform will be randomly selected according to the weights. In addition, the amplitude, tuning, duration and starting position of the grain in the waveform can be adjusted. If the playback reaches the end of a waveform and the grain is not finished playing, the looping option allows the playback to jump back to the start of the waveform. By triggering the grains periodically (for example with a loop in the Sequencer module) or more randomly (for example with a Distribution module), you can either perform synchronous or asynchronous granular synthesis. Many types of interesting sounds can be generated this way, from falling rocks, to fire, water or even crowds. Also don’t forget that, as we have seen in a previous blog, samples can be analyzed to extract parameters, for example to get an amplitude envelope to drive the Whoosh model or to create a set of resonant modes for the Impact model!